Open/Close Menu The Maori tribe is the largest social unit within traditional Maori society. Legend has it the first Maori that came to New Zealand did so in twelve large canoes each carrying a different tribe. Even today most Maori people can tell you which original tribe they are descendants of. 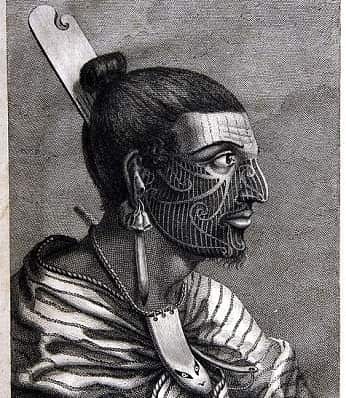 The settlers created a tribal society based on East Polynesian customs; Maori culture was also affected by years of isolation from other cultures. On this page, you will find a list of facts about Maori tribes including information on how they were organized and who the leader was. The Maori tribe is called Iwi in the Maori language. The Maori word iwi translates to "people" or "nation" in English. Each tribe (Iwi) is divided into smaller sub-tribes of approximately five hundred people called hapu. The hapu is the main unit in the Maori social structure. Each sub-tribe (hapu) consisted of several extended families called whanau. Within a settlement each sub-tribe has its own area that is independent from other sub-tribes. The area is divided among the various extended families. Every member of a Maori tribe had a specific role and a specific place within the social order. An individual's place within society was often signified by their garments and tattoos. People of high social status were always tattooed whereas tribesmen with no tattoos were considered worthless. At the top of the tribal social hierarchy was the chief referred to as ariki in the Maori language. The chief had "mana" (Prestige) which was inherited from his predecessors. Although the chief maintained power over the tribe Maori society did have a certain level of democracy. When important decisions were to be made, a tribal meeting would be arranged. This meeting would be held on the villages main plaza (called "marae" by the Maori) which was in front of the tribal meeting house (called "whare runanga"). At tribal meetings, all families were invited to give their opinion. The chief of the Maori tribe would listen to the opinions and then come to a final decision. The chief would always be the first person and the last person to speak. Maori tribe members who had great skill in a particular craft such as woodcarving were given the title "Tohunga". These individuals would not only be highly skilled in their craft but also very knowledgeable in the rituals of their craft. The indigenous inhabitants of New Zealand had no concept of land ownership. Land was only obtained by conquest and then had to be settled or used by the conquering tribe to truly be considered theirs. A 2013 New Zealand census listed the four largest Maori tribes as the ones listed below along with their population.